Title Card: Spain is the most powerful empire in the world. Philip of Spain, a devout Catholic, has plunged Europe into holy war. Only England stands against him, ruled by a Protestant Queen. 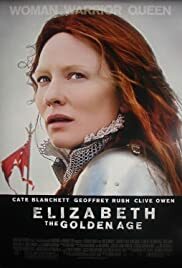 Q: Is this a sequel to "Elizabeth" starring Cate Blanchett? With a dream cast, a fascinating subject, and a budget larger than a pirate's booty, this film could have been great. But the chance is missed. (Pros:) The cast is definitely the film's biggest asset. 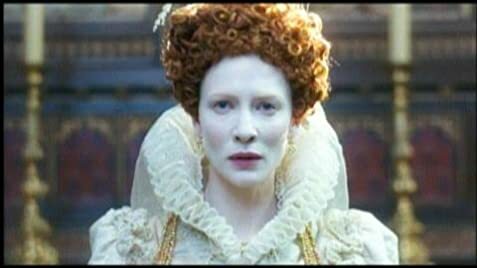 Cate Blanchett is incredibly brilliant even at times that the script fails to provide her with a worthy line. Her powerful performance is utterly captivating. Clive Owen's Walter Raleigh is as dashing as a man can be. As the man who charmed the Queen out of her heart and wits and dared to tell her not to act like a fool, Owen's Raleigh is daring at times, vulnerable at others, but always compelling and spectacular. Geoffrey Rush makes the best out of the very little that he's given to work with and Abbie Cornish and Samantha Morton are each great in their parts. It's also worth a mention that the costumes and the locations are spectacular, paired with a few moments of good story-telling (only if those moments would last all through the film) they make a few absolutely extraordinary scenes. Another great characteristic of this film is it's subtlety, the emotions that are there yet not talked about, the wishes, feelings, disappointments, desires, and fears that are only hinted are the best parts of an otherwise disappointing story-telling. The film could have benefited from more climax and action (the battle is barely touched), (other than a few great scenes) most of the story is told through conversations in closed areas. More than anything, the writers leaned on poetic lines to deliver their story. Also, for all it's subtlety, the film takes sides so obviously that it hurts any chances it had at reaching some level of realism or fairness. For instance, not only Phillip of Spain is utterly evil, he's one ridiculous, petty, dim character. Overall, the cast certainly makes the experience worthwhile, and as long as one does not expect absolute greatness or historical accuracy, this film can be great entertainment for most.